Social media has been established as a powerful way to get more traffic and build an authority on the web. Many people have used social media to become the leaders of their niches and ultimately dominate their industries. Social media brings over 10,000 people to this blog every month. Although social media is powerful, it is not something that we should rely on for blog traffic. There are several people who get all of their traffic from social media, or worse, one social network in particular. The risk with relying on social media, or even worse, a single social network to bring in the bulk of your blog’s traffic is that you are putting all of your eggs in one basket. Although the basket may look nice and stable now, the basket can suddenly break, and then all of your eggs are splattered on the floor. Do you want that to happen to you? 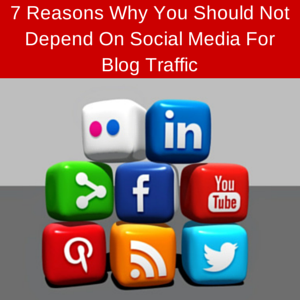 Chances are you don’t, and just in case that was not convincing enough, here are the seven reasons why you should depend on social media for blog traffic. One of the main reasons why I wrote this blog post was because I recently read an article about Twitter experimenting with an algorithm similar to Facebook. These algorithms enforce a pay to play system where growing a presence is no longer enough. Facebook posts now only get seen by about 3% of your audience which means to have a big impact on Facebook, you need to have a ginormous audience. There was a time when Facebook did not have these algorithms and everyone was happy. With Facebook’s change, many people say a noticeable decline in Facebook engagement and traffic. Would you be happy if you had a Facebook Page with 300 fans, but only nine of those fans could see the posts on their home feed? Does Twitter follow this exact path and create a pay to play system? Only time will tell, but Twitter talking about an algorithm suggests how little power we have in the decisions that popular social networks make. If Twitter decides to enforce the same policy as Facebook, then too bad. We will complain, but every social network has the final say in what happens. With the thought of a Twitter algorithm causing dissent amongst many users and a pay to play system being enforced, blogging has become more important than ever. Just because social media is powerful does not mean it is the only option. With a blog, you still have the power to publish content and share it with the world. Blogging also gives you numerous advantages such as growing an email list and bringing in more sales. These advantages allow you to control the communication that you have with the people who stop by. On the other hand, social media has direct control over all of the interactions you have on it. If a social network decides to suspend your account, all conversations come to an end whether you want them to or not. Many people look at Burger King’s success on the day it got hacked and aspire to be hacked themselves. Some accounts have even faked being hacked just to gain popularity. However, the latest hacks have not gone as well for the hacked accounts. An example of this was when Uber Facts lost over 10,000 followers on the day it was hacked. Ouch! The worst part about hackings is that in most cases, they are not under your control. Some information leaks out of social networks. Remember Heartbleed? Changing your password reduces the chances of your account getting hacked. However, anything on the web to get hacked nowadays, but if your social network gets hacked, and you have no other way of communicating with your audience, that spells trouble. Not only are you barred from your audience, but the hacker may use your account to insult your audience or post inappropriate content–all under your name. There are some social networks that encounter strange bugs that make them perform differently. There are some Twitter users who get their accounts compromised every single day for no reason whatsoever. When these accounts get compromised, no tweets can be sent out. That means all of those tweets that got scheduled on HootSuite cannot be sent out because of a flaw out of your control. No one is hacking into the account, and many of these Twitter users have resorted to 30 character passwords which still does not solve the compromise problem. If a bug affects your ability to post content on your social network, then you are losing blog traffic, interactions, and possibly sales. No matter how much hard work you put into growing your social media audience, most of that audience will not see the social media posts that you publish. If every single one of my Twitter followers saw one of my tweets and clicked on the link, I would be getting hundreds of thousands of visitors every day (at that point, move over Huffington Post). Too bad that is not the case. Unfortunately, no matter which platform you choose, not everyone will see your posts. However, social media happens to be a place where few people click on your posts and engage with you. I get over 10,000 visitors every month from Twitter alone. Assuming there are no repeat visitors (which is not the case), that would mean less than 10% of my followers see at least one of my tweets every month. The typical email list leads to more engagement than the typical social media account. Although social media is a great way to bring in more blog traffic, it is also extremely addictive. Some people spend hours on social media every week, and the amount of time people spend on social media takes time away from the big projects. Social media eats up more time than most people realize. Many people are spending three hours every day on social media while others are on social media for a longer amount of time. When someone finally logs out after spending three hours on social media, that person may remember the blog post that needed to get published or the video that should have been uploaded to YouTube. If you are unproductively using social media for three hours every day, think about how much time you are spending unproductively on social media within a given week, month, or year. It adds up. When people think of making money online, they want to make money as directly as possible. Many people have tried turning social media into a direct revenue stream, but that’s not how social media works. The function of social media is to build an awareness for your blog, get more traffic, and then have your blog optimized so it is able to bring in revenue. Since social media is addictive, it is entirely possible that the time you invest in social media does not necessarily result in more revenue. Just like the millions of other people who use them, I love social media. I am able to interact with my followers, build connections, and get more blog traffic. However, with the popularity of social networks, many people have become dependent on social media traffic for their blogs. Regardless of how many visitors a social network is bringing in, you need to avoid having all of your eggs in one basket. If that basket gets dropped (whether it’s your fault or not), your blog traffic will suffer. Utilizing social media while utilizing other avenues of traffic will allow you to become a successful blogger who is not dependent on one thing. Be sure to branch out by getting more traffic with different methods whenever you can.